With all modern diesel engined vehicles such as heavy goods vehicles (HGVs) now required to use a process called selective catalytic reduction (SCR). Finding a reliable supplier of AdBlue for your business is going to be of utmost importance. Beyond the requirements of its usage, Adblue also helps to reduce the number of harmful pollutants released from diesel-engined vehicles. This, of course, is beneficial for any business aiming to reduce it’s own carbon footprint, as well as helping to protect the environment. Here at Crown Oil, we’re doing all we can to reduce our own carbon footprint. Our Adblue diesel exhaust fluid (DEF) comes in secure packaging with clear instructions on how to use it. 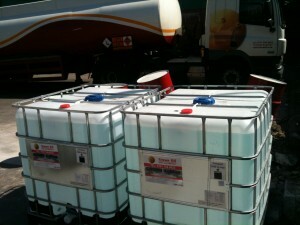 There should be a specified tank on your vehicle for topping up the DEF tank with the AdBlue solution. The SCR system in your vehicle is very sensitive, so care should be taken because if anything other than diesel exhaust fluid in that tank, you risk damaging the vehicle. Even water can damage the SCR system on your vehicle, so it’s not advisable to water down AdBlue additive if you find you’re running low. If your SCR system is damaged, it can be very expensive to repair it, so it is important to be cautious when handling your Adblue and top-up your vehicles. The diesel exhaust fluid tank on your vehicle is clearly marked. You can never be certain of the quality of a product with a similar name. So make sure you always buy the product called AdBlue. When you need to refill, only use equipment that’s designed for diesel exhaust fluid. Always close the AdBlue tank cover firmly after refilling. Diesel exhaust fluid will start to freeze at -10°C but it can be used when it has thawed. If you need to clean your AdBlue container, use demineralised water. Use water to clean any AdBlue that has spilt on surfaces, inside your vehicle or even on the ground. Storing AdBlue in direct sunlight will damage the quality of it. Your tank which holds white diesel fuel is not designed for AdBlue. The SCR systems can be damaged and cost a lot to repair if you put anything other than AdBlue in the AdBlue tank. Other fluids cannot be mixed with AdBlue – not even water, it will damage the SCR. If you think water or any other fluid has got into your AdBlue, do not use it and call us on 0845 313 0845 for advice. If you have any further questions about Adblue that we haven’t answered here, you can call our knowledgeable and friendly team by calling us on 0845 313 0845. You can also request a quote by phone or by filling in the online quote form on this page.